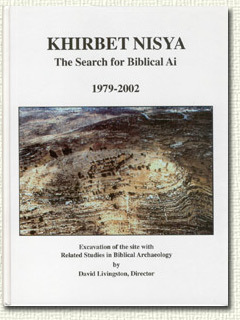 This book is a final report on 24 years of excavations at Khirbet Nisya, Israel. 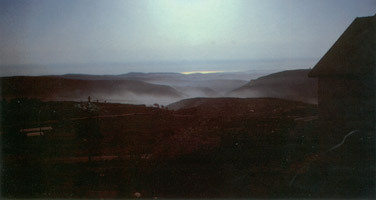 "Khirbet" means "ruins," and "Nisya" means "forgotten." They are the "forgotten ruins" of what we believe was biblical Ai. (When we first found the site it was not on the registry of hundreds of sites in Israel at the Israel Antiquities Authority.) Could this be the Ai of Joshua's time? We believe so and that is what the book is about. The book was written with laymen in mind as well as professional archaeologists. Two-thirds of the book was done to (hopefully) satisfy professionals. But even that material we tried to deal with in a manner that might interest nonprofessionals. There are several chapters suggested by finds at the excavations which are meant to be enlightening biblically. We consider the Bible as Truth and a guide, not only religiously, but also historically. One chapter is an in-depth study on the location of Bethel, the second most-mentioned city in the Bible next to Jerusalem. Both the traditional locations of Bethel and Ai apparently were wrong. This has had considerable implications for dating, especially for dating the Exodus and Conquest. Another chapter examines the present consensus on dating these two climactic events, and shows how the scholarly world went the wrong direction, leading to many current incorrect conclusions regarding locations and dates, all resulting from previously proposed sites for Bethel and Ai. One must read the author's correspondence with Drs. Kelso and Albright in an appendix. The former was one of the author's professors at seminary, a very close friend, and was actually the editor of The Excavation of Bethel. Their responses to his changing the locations of both Bethel and Ai are very instructive. The identification and location of Biblical Ai. (A thorough study on the significance of Ai. Why correct dates are vital for the Biblical Exodus and Conquest. Olive oil production and use in antiquity. Staff and volunteers for all seasons. Correspondence with J. Kelso and W.F. Albright. List of objects for all seasons. Indicate how many copies of each you would like. Please enclose check or Money Order made out to "Beth Bray".